Nigerian football player Odion Ighalo has used the new single by TY Bello and Tope Alabi Logan Ti Ode has an apt testimony describing his fall out and bounce back. 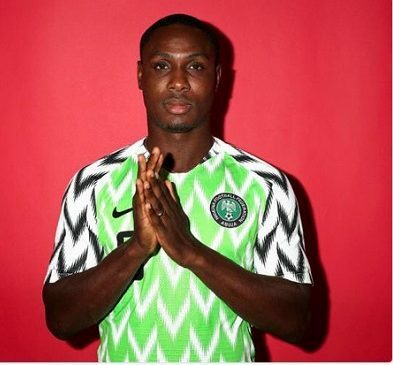 Having fell out of Nigerian football fans’ favour when he failed to convert a clear cut scoring opportunity at the 2018 FIFA World Cup in Russia in a crucial match against Argentina which led to the eventual lost of the Eagles out of the World Cup tournament, Ighalo has bounced back to scouring ways, netting six goals in three games for the Super Eagles – against Libya and Seychelles. Celebrating and relating with the song by TY Bello and Tope Alabi, Odion Ighalo used the lyrics to tell fans his story and the trials he has faced before returning to his glory days. Ighalo said he faced much criticisms after the World Cup so much the he and his family received death threats but after scoring five goals in two matches for the team including a hat trick and shinning brightly in China, the former national U-20 captain on his Instagram handle dedicated the motivational song by Tope Alabi to help tell his life experience and what he has gone through. “I know what my eyes have seen, I know what my ears have heard, but the moment I heard your good news my life found new meaning. I have heard about the terrible gossips about me, I know what people might have said, there was a time they called us barren, or perhaps, they once called you a failure. But know this, the moment the savior steps in, your life finds new meaning. But know this, the moment h arrives, your life is set in order,” the lyrics of the song say. Ighalo is preparing for the crucial 2019 AFCON qualifier against South Africa with the Super Eagles. The march is set for Saturday, November 17 in Johannesburg. The song “Logan Ti Ode” by TY Bello featuring Tope Alabi is off the Spontaneous Worship series by the former. The single has hit the number spot on Youtube in Nigeria presently.